Arsenal can challenge for next season's Premier League title if they complement their free-flowing football with the steel to win when not at their best, says manager Arsene Wenger. The Gunners, who last won the title in 2003-04, are chasing second place this season and host Swansea on Monday, having won nine of their last 10 games. "You cannot play 38 games in the same convincing style," said Wenger. "You need balance so if you are not at a level of fluency you can still win." The Frenchman believes he has his central defensive options in place for next season and will not be looking to sign anyone in that position for next season. 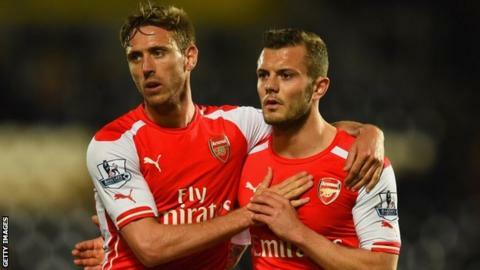 "Four is enough," said Wenger, referring to Laurent Koscielny, Per Mertesacker, Calum Chambers and Gabriel - who Wenger added will be "a great central defender" - while he also has Mathieu Debuchy and Nacho Monreal who can "play there". Arsenal lost the reverse fixture in November - conceding twice in the last 15 minutes after Alexis Sanchez had put them ahead - and 20-year-old Chambers, playing at right back, was given a torrid time by Swansea's Jefferson Montero. Wenger said: "Callum had some difficult games, but that's part of gaining experience and the learning process. Everybody goes through that. "When they come out of it, they are stronger. He analyses well what happens and I think he will learn and come out stronger."